As a teacher, you're always looking for new ways to inspire and engage curious minds. Allow us to serve as an educational resource for you and your students. 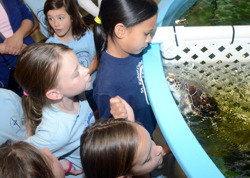 Dive into the world of wonder and water by taking students on a journey “from North Carolina’s mountains to the sea.” Featuring beautiful, realistic exhibits, the Aquarium is home to thousands of aquatic animals from across the state. In our galleries, explore a mountain waterfall and trout pool, watch North American river otters play, and experience what it's like to touch a skate and ray. Our Living Shipwreck exhibit is the largest in the state, holding more than 300,000 gallons of water, big sharks and an ocean of fishes. Two hands-on touch pools, one with marine invertebrates the other with stingrays, epitomize experiential learning for your students. Our 150-seat auditorium enables large groups to further explore science through live animal presentations that correlate with NC Standard Course of Study. For a nominal fee, there are additional opportunities to further engage in learning with your students through outdoor field studies and behind the scenes tours. Group size for these programs are limited. 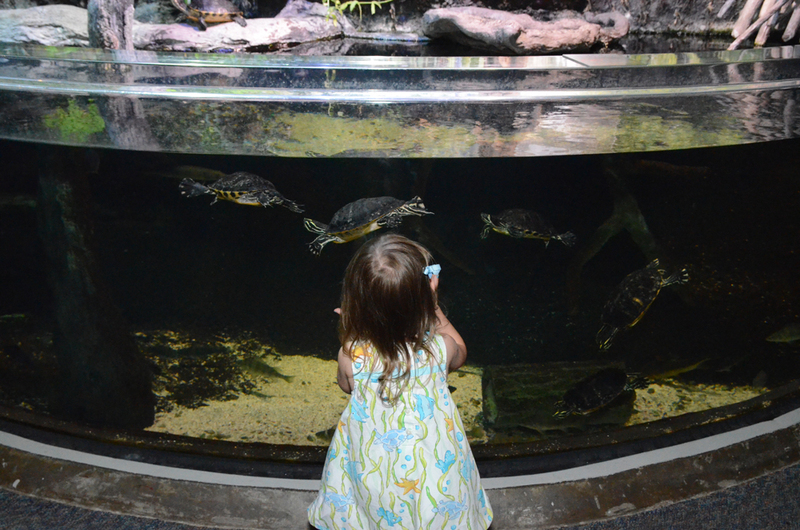 Register your group in advance for free admission to the Aquarium. Children, teachers and staff in registered North Carolina school groups are admitted at no charge at the time of the visit, if registered in advance. Register early because the Aquarium is a popular destination and reservations are taken on a first-come, first-served basis. The admission fee for registered parent chaperones is $8 per person. At SciREN events, researchers provide educators with K-12 classroom ready lesson plans, which are based on their current work and adhere to state and national educational standards. SciREN gives researchers and educators opportunities to arrange classroom visits and to collaborate on curriculum development. All interested teachers and educators are welcome to attend! The next SciREN Coast event is February 7, 2019 from 5:45PM-8:00PM at the NC Aquarium at Pine Knoll Shores. Registered North Carolina home schools are offered one free general admission visit per year. This visit includes school age children in grades K-12, or ages five through 18. Children age two and under are admitted free of charge. Children that are not school-age, ages three and four, are required to pay general admission. Youth admission rate is $10.95 plus tax. Proof of homeschool status must be presented upon check in with Visitor Services in order to receive the free visit. Proof may include but is not limited to state issued home school documentation showing your ID number, a school ID card, official email, online verification sheet, school curriculum or enrollment form into a homeschool group. During this yearly visit, two teachers or administrators are included in the free admission. Additional adults during this visit will have to pay general admission. General admission is $12.95 plus tax. Seniors and military get a discounted rate of $11.95 plus tax. Open 9 a.m. to 5 p.m. daily. From the mountains to the sea… Feel the spray of a mountain waterfall. Watch river otters play. Touch a stingray. Look a shark in the eye. Explore shipwrecks — without getting wet. See a rare white sea turtle. Thousands of aquatic animals take you on a journey from the state’s grand peaks to the open Atlantic, much as a raindrop makes its way to the ocean. See Plan Your Visit for more on these activities and other family fun at one of the coast’s most popular attractions.